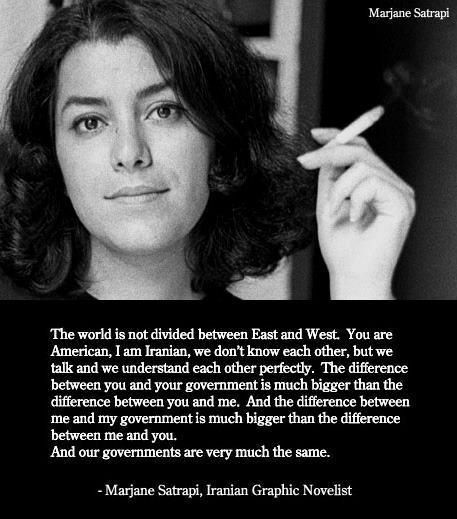 Satrapi was born in Rasht and grew up in Tehran in a middle-class Iranian family. Her well-to-do parents were highly educated members of an urbanized stratum of Iranian society. Apart from her native language Persian, she speaks French, English, Swedish, German, and Italian. Satrapi became famous worldwide because of her critically acclaimed autobiographical graphic novels, originally published in French in four parts in 2000–2003 and in English translation in two parts in 2003 and 2004, respectively, as Persepolis and Persepolis 2, which describe her childhood in Iran and her adolescence in Europe. Persepolis won the Angoulême Coup de Coeur Award at the Angoulême International Comics Festival. Her later publication, Embroideries (Broderies) was also nominated for the Angoulême Album of the Year award in 2003, an award which was won by her novel, Chicken with Plums (Poulet aux prunes). She has also contributed to the Op-Ed section of The New York Times. This entry was posted in Cinema & Showbiz, Women and tagged Awards, Cinema, Movies, women. Bookmark the permalink.